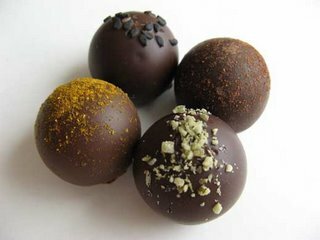 A chocolate tasting of five different chocolate purveyors in New York City. Since 2002, Kee Ling Tong has been creating a lovely following for her chocolates. I met Kee at her small chocolate shop in Soho. She was friendly and informative and told me that she makes all her chocolates daily for the freshest quality. Wow. To tell the truth, I didn't know much about Kee’s Chocolate before entering the shop–just that they have a cute website. I highly recommend these chocolates with their fresh ingredients, melt-in-your-mouth ganache and absolutely no pretension. I enjoyed all the chocolates I sampled, but Black Sesame particularly knocked my socks off. Chantal Coady of Rococo Chocolates has called Robert Linxe the high priest of chocolatiers, I now understand why. If you are a chocolate lover. an aficionado or just a plain chocolate snob, I dare you not to like theses chocolates. The chocolates at La Maison Du Chocolat are, well, just plain awesome. Refined chocolates with classic flavours, subtlety infused in the smoothest, creamiest, ganache: what is there not to like? I enjoyed all of my sampled chocolates tremendously, but the Maïko and Cannelle put me into a chocolate coma. Mr. Linxe is clearly a master at creating some of the best chocolate I have ever eaten. The Michel Cluizel shop in New York is actually hidden inside ABC Carpet & Home. If you venture in, you will find lovely cases filled with chocolates displayed like fine jewelry. There is also a small bar, where for a fixed price you can try one of their chocolate tastings. Remember to make a reservation, as they are very particular. I have tried Michel Cluizel chocolates in the past and thought they were good; however, I have always felt unsure whether they were exceptional. After trying these new flavours, I can definitely say that I am a fan. 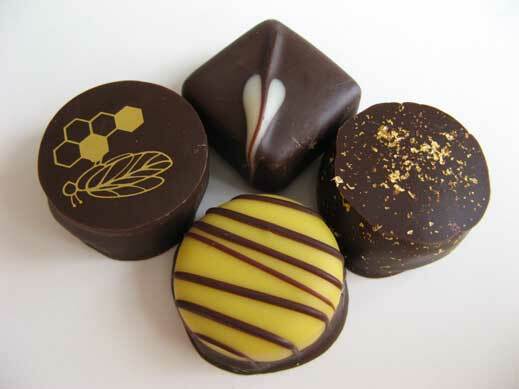 The Mirabelle truffle and the Chestnut Honey were both delightful. The first time I tried chocolate from Richart was when my friend Dawne came back from a trip to Paris. Fortunately, she brought back and shared some of her chocolates with me. Thanks Dawne! The chocolates at Richart are well, beautiful. I don’t think anyone would contest that. Richart chocolates have a long history in Lyon, France. Two generations on, Michel Richart continues to create chocolates that are designed to develop and pursue the “Art of Tasting”. 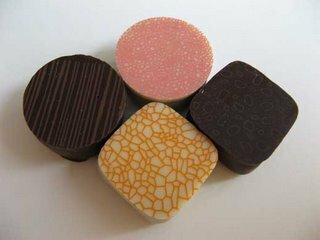 Most of the chocolates here are silk-screened with cool and colourful designs–sometimes almost too pretty to eat. They are of a high standard; however, I thought that the emphasis should have been placed a little more on the taste rather than the appearance. Do not get me wrong; these are good chocolates. The Apricot Coulis was lovely, and the Roasted Almond was very tasty. The other two chocolates I tried were, however, a bit too strong in liqueur for me. 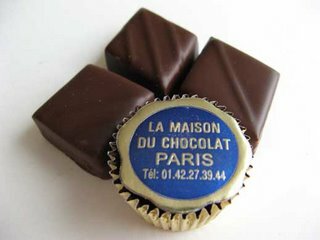 The petit Richart chocolates line is an excellent idea: these bite size chocolates are the perfect size for one small intense shot of chocolate. To say that the chocolates here are worldly is an understatement. Ever since Katrina Markoff opened Vosges, she has created quite a stir in terms of her approach to chocolate making. 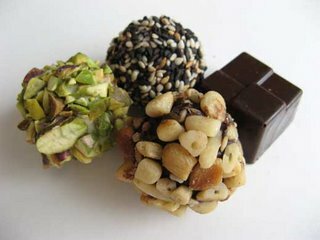 The chocolates here are globally inspired pairing exotic spices and flowers with high quality chocolate and craftsmanship. Vosges is chocolate for the new international palate. If you are open to new and unusual flavours not commonly found with most chocolatiers, give these chocolates a chance. Although I wasn’t crazy about all the flavours I tried, I especially liked Naga which was delicious. Posted by Sam at 9:22 p.m.
Can a chocolate have too much liqueur??? I live just near Michel Cluizel chocolatrium... It's great. We always taste M Cluizel chocolate for "café". What a rough job...but someone had to do it right? Love Richart Chocolates for it's gourmet French chocolates.